The firm of Steinway was founded in New York City in 1853, and their first workshop was a loft acquired from the piano builders Nunns and Clark who were relocating to larger quarters. 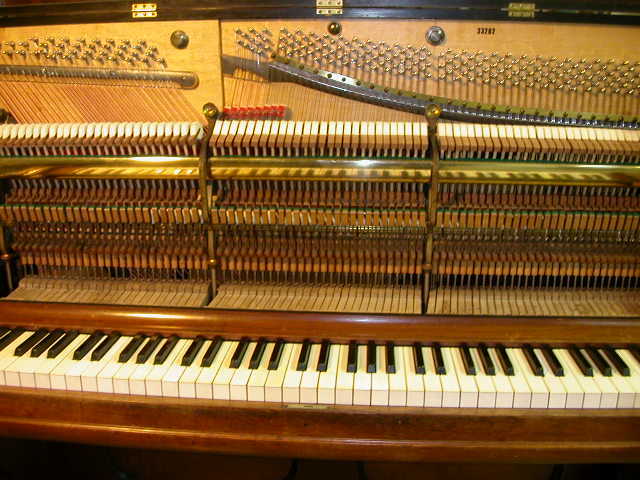 The first Steinway pianos were squares and conventional grands. They won awards for these instrumemts in exhibitions early in the firm’s existence. 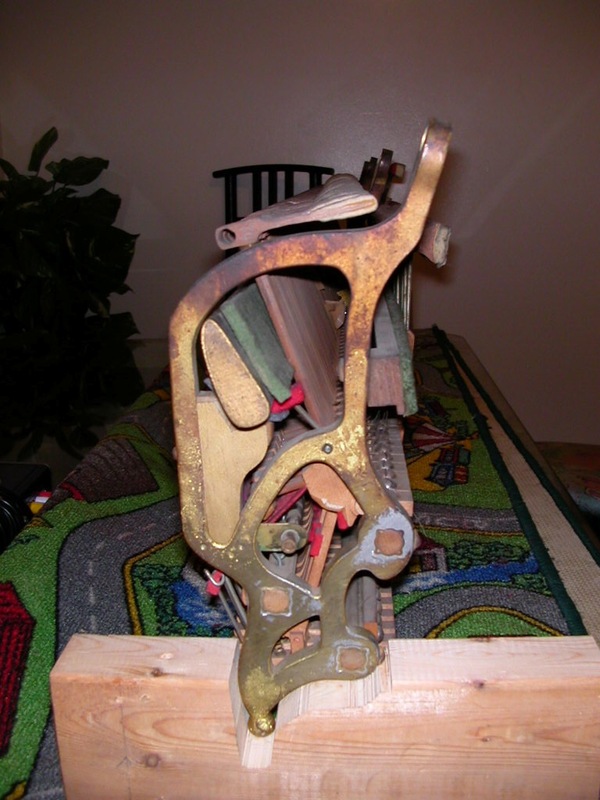 The first Steinway uprights went into production in 1870, and were called Model 1. 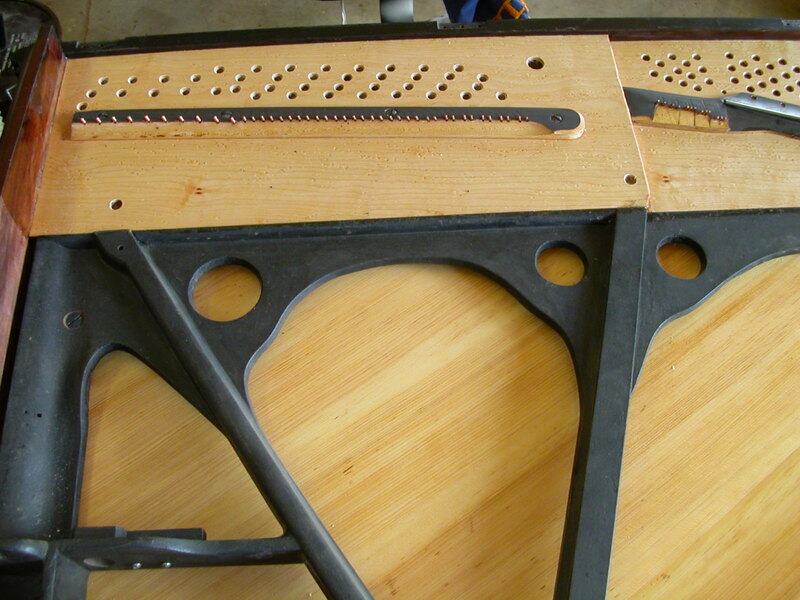 Following is a overview of a Steinway Model 1 which I rebuilt a few years ago. 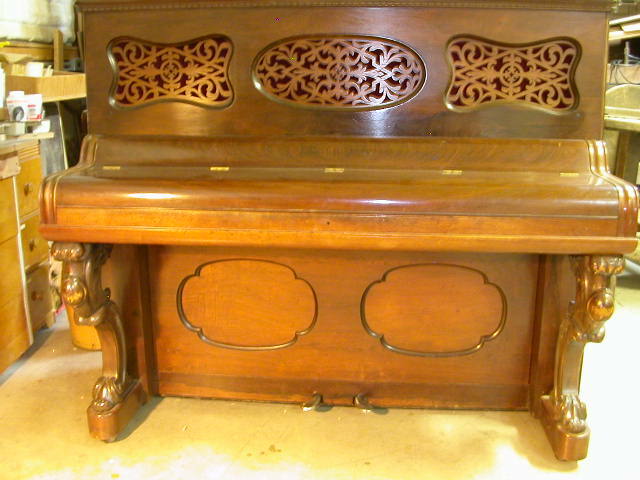 The completed piano: Rosewood cabinet, 85 keys. Completely disassembled: soundboard repaired with wooden shims, refinished soundboard, bridges cleaned and re-graphited. The original pin block was still very solid but the top veneer was loose. The nut was carefully removed and the block veneered with beautiful bird’s eye maple. The bass area of the restored pin block with the bass nut glued in place and the plate installed, tuning pin holes drilled to house new 2/0 tuning pins. The treble area of the pin block with the nut and new 5/32″ rod in place. Black felt was used ahead of the hitch pins as well as back string felt. Tracings of the treble strings is the first step to calculating a new stringing scale, using an advanced computer scaling program that allows selection of various alloys of wire. Since this is a piano built during the development of steel wire, using historically correct wire is vital. 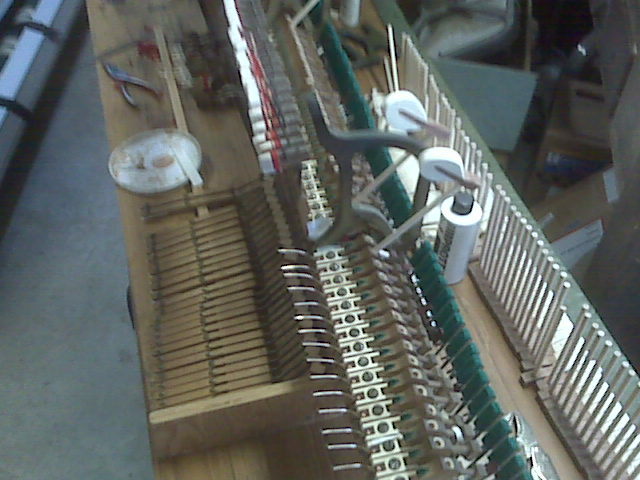 Most of the treble wire on this piano is “Pure-Sound” piano wire from The Netherlands. The newly strung piano, back on its feet and the keybed attached. Signatures on keys from factory workers. 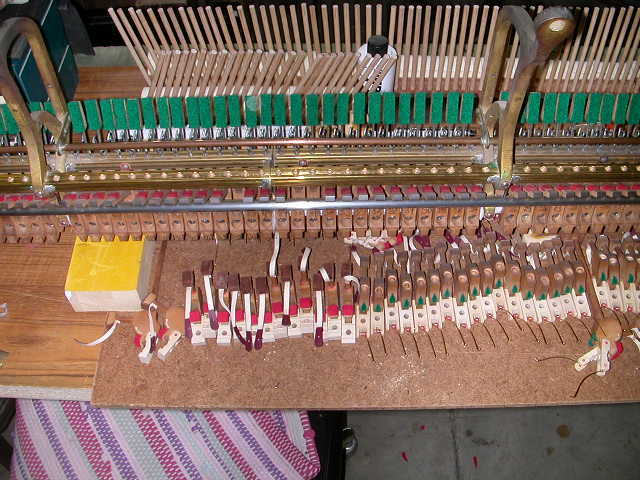 All keys were carefully restored using ivory salvaged from “retired” pianos. Work on the action was extensive and comprehensive, including new leather, new Steinway flanges, all new felt and cloth parts, Renner hammer shanks in two sizes (smaller diameter in the high treble) and made-to-measure Abel hammers. Interior views of the completed Steinway Model 1. Notice the overdampers in the low tenor section.